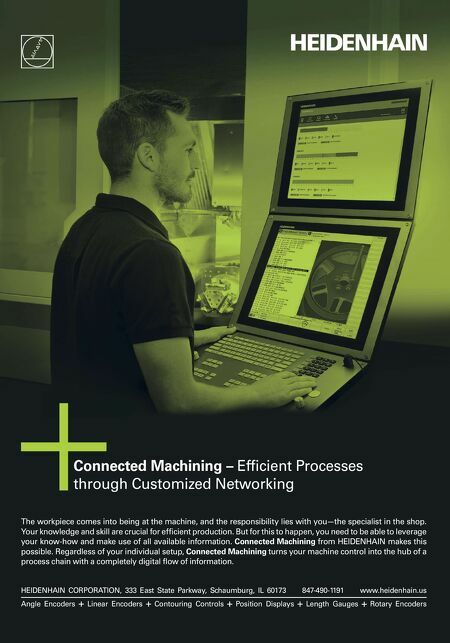 CNC TECH TALK MMS JUNE 2018 36 mmsonline.com Processes and Programming Holding Size with Tight Tolerances CNC machines produce very accurate workpieces, and they do so repeatedly for two or even 2,000 workpieces. Dimensional tolerances between ±0.002 and 0.005 inch (50 to 127 microns) are easy to achieve initially and hold throughout a cutting tool's life. Tolerances between ±0.001 and 0.002 inch (25 to 50 microns) are still easy to achieve, however, holding these tolerances though larger lot sizes will require consideration if tool wear causes surface growth or shrink- age past a tolerance limit before the cutting tool wears out. Tolerances of less than ±0.001 inch (25 microns) are more challenging, yet many companies regularly hold even tighter tolerances between ±0.0002 and 0.0005 inch (5 to 12 microns). These tolerances require consideration to achieve initially and hold for multiple workpieces. Here are some sug- gestions for dealing with them: • Use metric mode. Metric mode has a finer resolution than inch mode. The metric-mode least-input increment for offset entry is commonly 1 micron (0.001 mm). The inch-mode resolution is commonly 0.0001 inch. Note that 1 micron is less than half of 0.0001 inch. If using the inch mode, a 0.001-inch (25-micron) overall tolerance will have 10 settings in the offset register that will place the dimension within specification. Using the metric mode will provide 25 such settings. This makes it much easier to achieve a tight tol- erance and hold it through tool wear adjustments because operators can specify more precise adjust- ments required to achieve target dimensions. • Use 80 percent of the tolerance band. With tight tolerances, sizing adjustments will be required during the production run. As tools wear, the sur- faces they machine will grow (external surfaces) or shrink (internal surfaces). The tighter the toler- ance, the more sizing adjustments will be required. A common rule of thumb is to target the mean value of the tolerance band when initially sizing in a dimension and when making tool-wear-related sizing adjust- ments. When you target the mean value, you are working with only half the tolerance band. The related dimension for all machined parts will be on the high side for external surfaces or the low side of internal surfaces. With very small tolerances, your operator may have to make a sizing adjustment every few workpieces. If you target something closer to the low or high end of the tolerance band (depending on external or internal surfaces), you can extend the time between required sizing adjustments. I recommend making the target dimension within about 10 percent of the tol- erance limit. This will double the time between sizing adjustments. • Minimize the effects of thermal deviation. This point applies more to turning centers but can also impact machining centers. As machine tools warm up, their components grow. As warmed-up machines sit idle, their components shrink. As The metric mode makes it easier for operators to specify the amount of adjustment tht brings a critical surface to its target dimension. 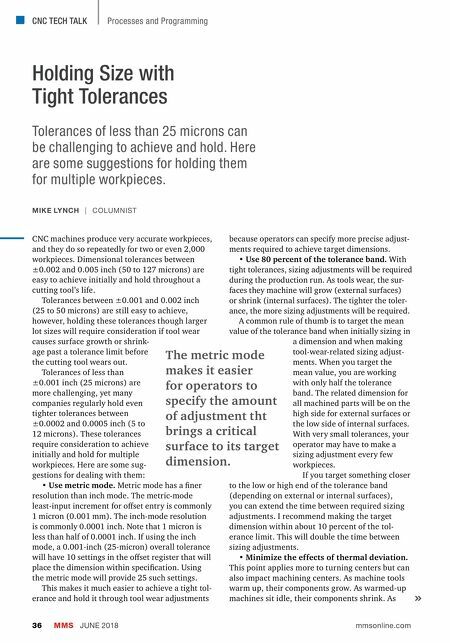 MIKE LYNCH | COLUMNIST Tolerances of less than 25 microns can be challenging to achieve and hold. Here are some suggestions for holding them for multiple workpieces.